Inlet/outlet opes can vary to suit 225mm, 300mm and 375mm Condron Concrete S&S Pipes, Ogee Pipes or (proprietary) Twin Wall and P.V.C pipes. Base Configurations can incorporate a third inlet/outlet ope and are available left or right handed. Extendable depths and standard manhole covers available. 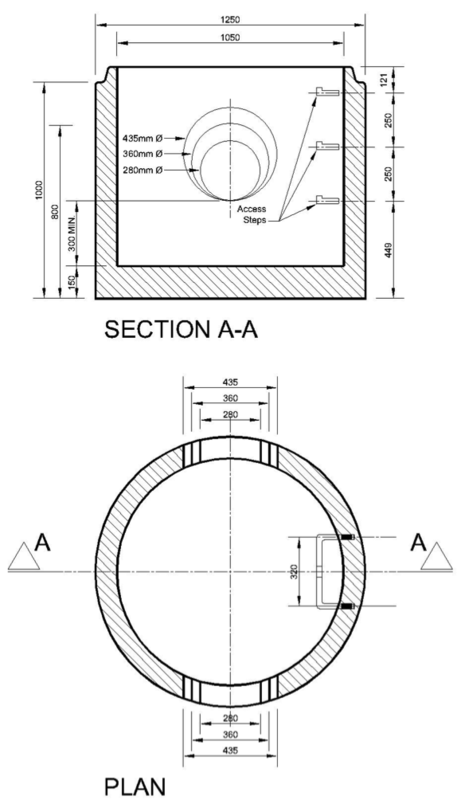 Chamber Catch-pits can be supplied in 900mm or 1200mm Ø upon request. National Roads Authority (NRA) approved. Catch Pits must be handled using a specialist grab and never lifted using slings through pipe opes or step rings.